This is graduation season. 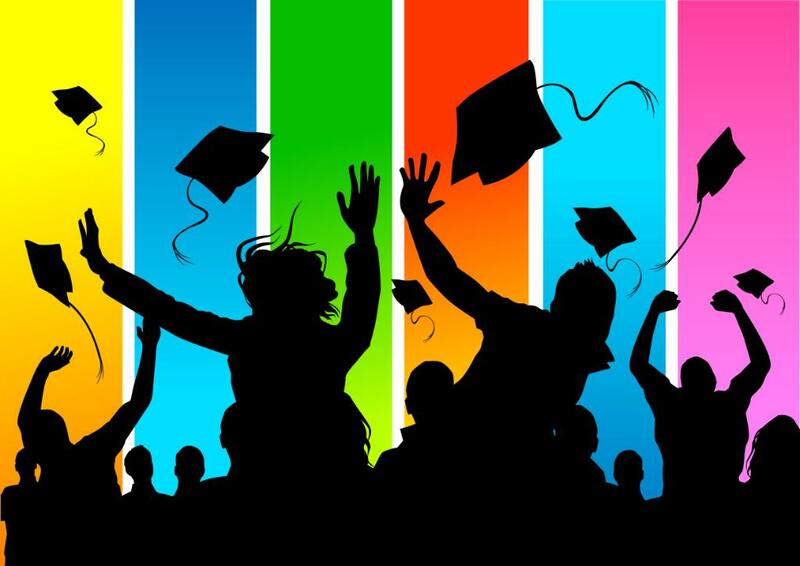 Many high-school and middle-school students will be moving on to the next stage of their lives. Some will be sad to say goodbye to their school, classmates and, maybe, even a teacher or two. Others can’t wait to leave it all behind. But whether you are graduating or not, it’s likely that success and happiness are high among your goals. That’s fine; but be careful, they don’t always come together. Not all successful people are happy and not all happy people are successful. The thing to remember about happiness is that it’s not determined by what you have or even what happens to you; it’s a function of how you think about your life. Optimism and gratitude are powerful happiness potions. If you want to be happy, discipline yourself to look for the best in people and situations. If you draw a lesson from every mistake and setback, failures transform from stumbling blocks to stepping stones. Money – the pursuit of it and, often, the lack of it – is likely to play an important role in your life. Don’t let it be the leading role. Sadly, money is much more likely to be a source of worry, resentment and frustration than of happiness. Money becomes a problem when you want more than you can afford and you spend more than you earn. If you want to be happy live within your means, stay out of debt. The surest road to happiness is good relationships. Choose friends who want the best for you and bring out the best in you. Be willing to love with all your heart, but don’t put the key to your happiness in anyone else’s pocket by making it depend on the love or approval of anyone, and certainly, don’t make anyone a priority who only makes you an option. Finally, don’t settle for a little life. Fill it with purpose and meaning and people worthy of your love and respect. Summer vacation is just around the corner. That means our experiment with these announcements is about to end. I hope you will tell your teacher whether you found value in them. blog on my iphone during lunch break. I enjoy the knowledge you provide here and can’t wait to take a look when I get home. 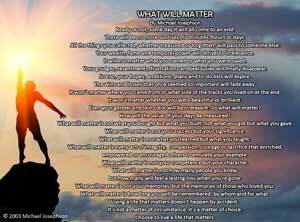 What Will Matter has been my favorite writing for years. I am a mom of a profoundly disabled daughter. A mom who has fought MANY medical issues WITH myself and my husband. A mom who has been estranged from my oldest daughter, her son’s and my great grandson that I’ve never met. What Will Matter puts it all in perspective. I ask God only to allow me to to care for my daughter Connie until He takes her home. My favorite prayers are The Serenity Prayer and a prayer of only praise and gratitude. My favorite passages are Isaiah 11 The Promise and my favorite scripture is Be still..and know that I am God. Psalm 46:10. I have all I need!! !